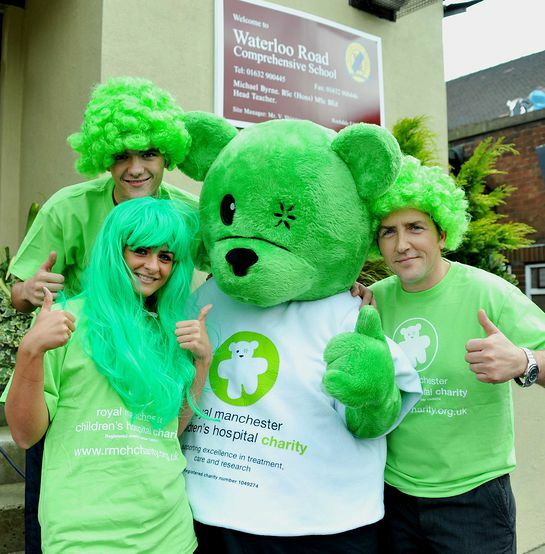 Waterloo Road stars Jason Done, Rebecca Ryan and George Sampson are backing Be Seen In Green Day in support of Royal Manchester Children’s Hospital charity. The stars donned green wigs to launch Ryman’s Be Seen in Green Day, which is a fundraiser for schools that takes place on 4th November and asks pupils to make a small donation to the charity in return for being able to wear something green to school. Schools that register for the event sponsored by Ryman before 14th October will be entered into an exclusive prize draw in which four winning schools will be visited by the cast members of Waterloo Road, who will take part in a question and answer session. Be Seen in Green is being supported by Ryman, the UK’s leading specialist stationery and office supplies company, whose chairman is Theo Paphitis, star of BBC’s Dragon Den. To register your school for the event please call the charity office on 0161 276 4522 or click here.